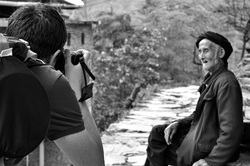 Do you run photography workshops? Are you part of a photography club or do you run photo tours? We would be delighted to help support and guide your trip. We are Guilin photography specialists and have experience in arranging and designing Guilin workshops, club trips and assist niche tour operators run workshops in Guilin. We might be running one or two very small group workshops, informal and hands on. Learn together on location with a guide. This will be in April, May and June 2018, aimed at beginner and intermediates, focused only on landscape, cormorant fishermen and HDR. Please contact us if your interested. Max 4 people. Hands on Landscape and People in natural light. Also covering learning Multi-Exposure & HDR. We have a use a number of different size cars, vans, buses, and access to small and large coaches. Typically newer German VW Passats, American Buick GL8 and some Chinese medium size mini-vans. Our local partner offers us amazing prices on this micro-bus, this allows us to offer a photography club or workshop a 19 seater air-conditioned bus at almost the same price as a typical 8-12 seat mini-van, giving you plenty of room for each persons photography kit, ideal for 10 client groups with our guides, your team and luggage. 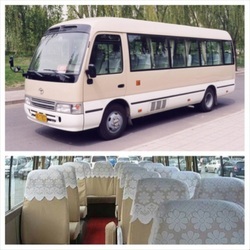 This larger capacity micro-bus works well for trip budgeting, as numbers fluctuate you do not need to worry about increasing car costs. We simply charge a daily set guiding fee for groups under 6 people. Photography workshops, clubs or photography tour companies with over six people are charged x2 as the logistics involved often require more prior planning. Some days we might need to provide two guides, allowing for times when a group might need to be slightly separated due to space on location or a fixed physical ability of the group. In November we will be starting to list our partners' workshops on this page. If you are running a photo workshop or a club trip to Guilin and wish to list, drop us an email and we will tell you more.